The contribution of India Inc’s profitability to the country’s GDP dipped to a 15-year low in fiscal 2018, thanks mainly to the below par performance by public sector banks. From a high of 5.5% in 2008, the ratio of corporate profitability to India’s GDP is currently at 2.8% — the same level it was in 2003. The other sectors that contributed to this decline significantly were the metals and oil & gas sectors, where prices are dictated mainly by global factors, along with the telecom sector, which saw huge competition in the past few years. On the other hand, the sectors that cushioned the fall were private banks, NBFCs, autos and technology, all of which put up a good show, according to a report by domestic brokerage major Motilal Oswal Securities. The good news is that the broking house believes that the recent low could be the bottom and expects the corporate profit-to-GDP trend to improve from fiscal 2019 onward, “even as we do not foresee acceleration like 2003-08”. 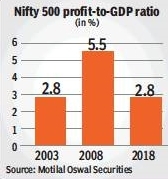 Banks (both PSU and private) — one of the biggest contributors to the down-trend in corporate profit-to-GDP ratio — are expected to drive the expansion as asset quality bottoms out, fresh slippage generation moderates, provisioning cost normalises and loan growth recovers, the report said. Analysts at Motilal Oswal Securities noted that in every cycle, new sectors evolve and contribute to the profit-to-GDP metrics.